When I was pregnant, I used this shampoo consistently. I loved the smell of it. 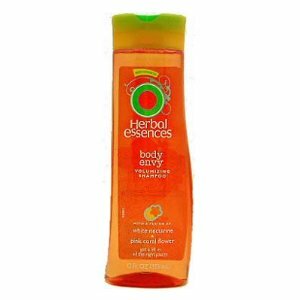 According to Herbal Essences’ website, it is formulated with passionflower sunrise and pearl. I don’t know what that means. During my pregnancy, it was the only shampoo scent I could stand. It gave me great hair – lots of body and lustruous shine to my hair. Now post-pregnancy, I think the whole shine shebang, was due to my pregnancy hormones. Some women during pregnancy get the shine, the glow, and all the good stuff. I guess I was one of them. Because after giving birth, and now that my hormones have regulated, this shampoo causes a lot of dandruff. Not the tiny specks but large pencil eraser sized patches of scalp. It is the oddest thing. It is a shame. My husband recently bought the Sam’s club bulk size of the shampoo.